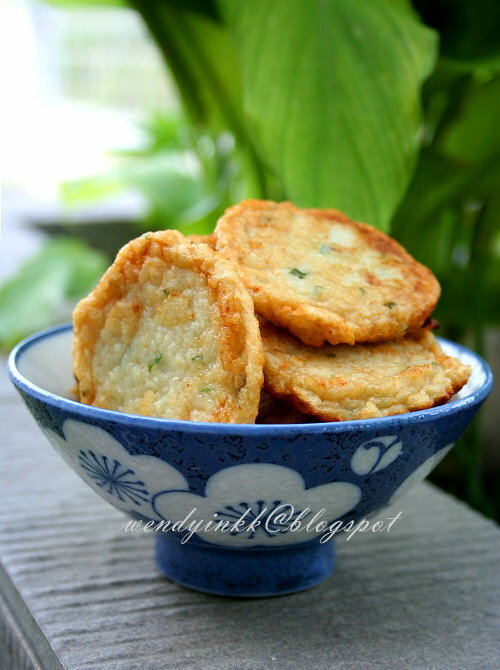 I love this fishcake, my hubby was so so. It has a slight crunch to it due to the arrowheads. It’s not the usual springy springy type. Reuben loved it and took 3 himself. This is also suitable for bentos. I happen to have yellowtail fusilier(ikan tauhu) in my freezer, you can use mackerel if you want, but I think you might need lesser if you are using mackerel. The fish is there to for flavour only, the arrowhead provides texture. I might have been greedy to double the fish that what I should be using. LOL. You might want to try the original ratio that is 1 part fish to 4 parts arrowheads, so that you will taste more arrowhead. 1. Grate half the arrowheads. 2. 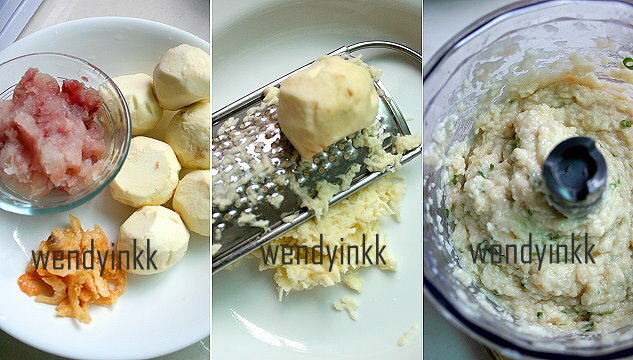 Put the balance of arrowhead, fish and dried prawns into a food processor. Let it run until the arrowhead is finely ‘chopped’. 3. Add seasonings and spring onions and process until well combined. 4. Combine with grated arrowhead. 5. Heat a pan and put in some oil. Smear the back of spatula with oil too. 6. Use two spoons to form the paste into a ‘golfball’. 7. Place onto the pan and use back of oily spatula to press the golfball flat. 8. 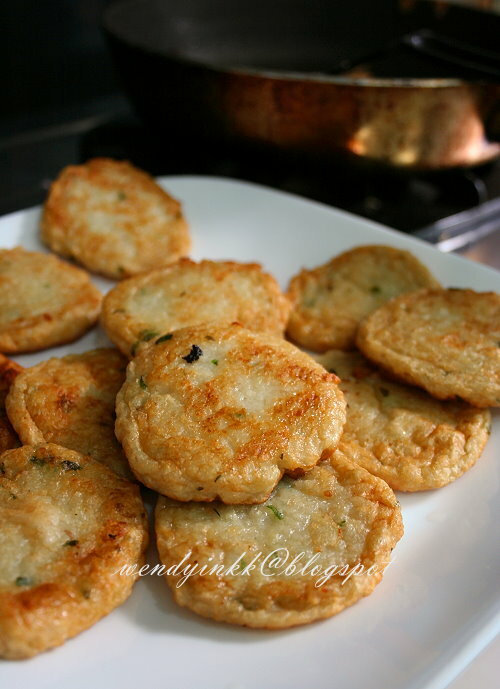 Fry until both sides of fishcake is golden. Dish up. 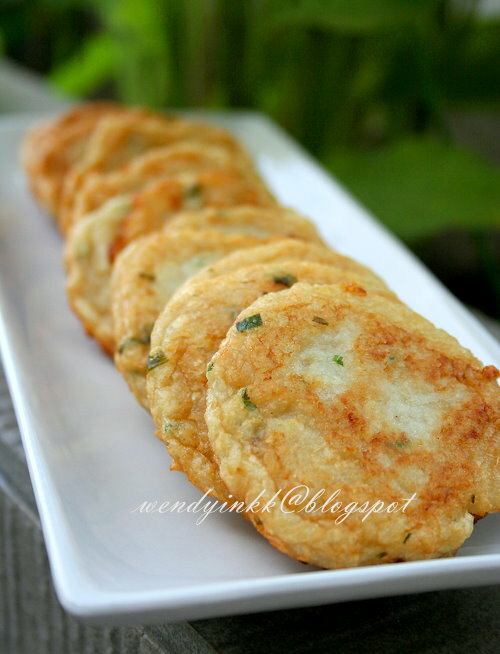 Never thought of making fishcakes with arrowheads. Thanks for sharing! Oh me too, never came across making fish cakes using arrowhead before. Looks yummy too! Thanks for sharing with us. oh nice.. I'm sure this will be get lots of fans!!! Arrowheads in fishcakes? Hmm..interesting and i bet it gives a wonderful texture. Can I use fish paste instead of fish flesh? I'm sorry but that can't be used as cooked fish flesh would have lost its binding power. Hi Wendy, thanks for your reply. I guess I'll use it for fried rice then. Love your blog. I came across your blog when I browsed for japanese cotton cheesecake. I live in Iceland where the ingredients are limited. I really love fishcakes but I could not buy fresh arrowheads. The Thai shop here in Reykjavik sells only arrowroot flour. Could I substitute the arrowheads with the flour? Thanks alot and look forward for your input! You can refer to my other homemade fishcake recipe that uses corntstarch. That recipe is different from this and this arrowhead fishcake probably is not the one you have in mind.